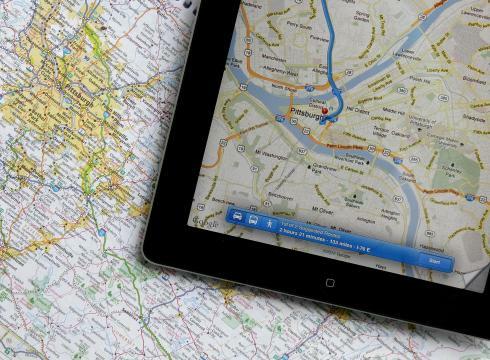 We have visual and verbal maps, trail info and the location of every single water stop along the way. 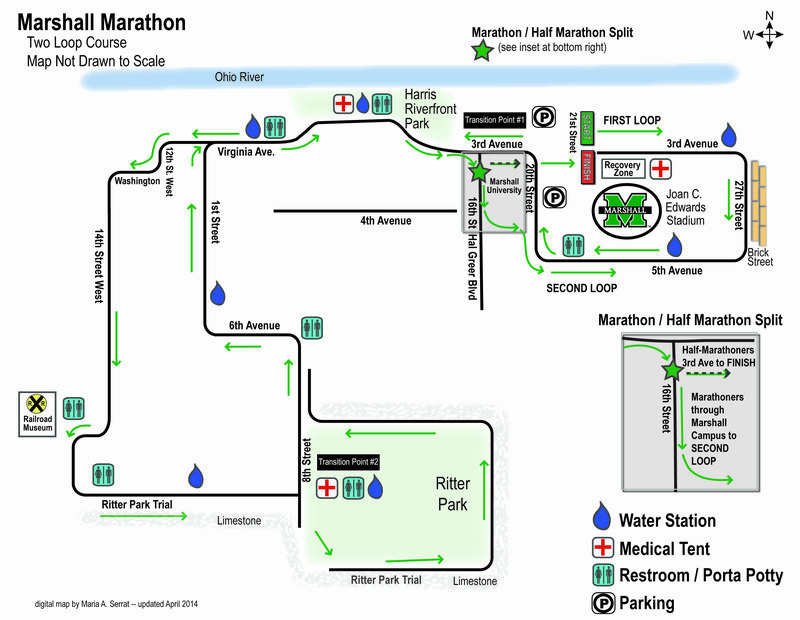 Click here for a map of the full/half-marathon course. Click here for a map of the Water Stops. Note: Some of the course is on the crushed limestone path around Ritter Park and the trail that leads to the park. It is very compacted and fast. You do not need special shoes for this. The total of the trails on this surface is only 3 miles approximately. 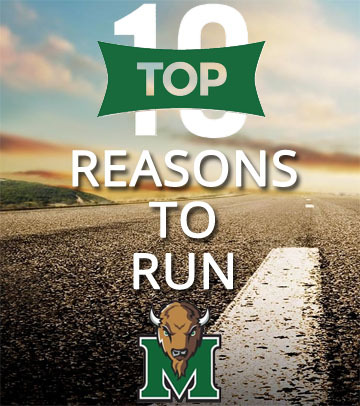 The total ascent for the Marshall-St. Mary’s University Marathon is 201.62 feet. The following is a verbal description… it sounds more complicated than it is as you would expect from a verbal description. Begin next to Joan C. Edwards Stadium (west ramp) on 3rd Avenue and 19th Street. Head east 1.2 miles and turn right on 27th Street (brick street). South quarter mile and turn right on 5th Avenue. Head west 1.2 miles and turn right on 20th Street. North quarter mile and turn left on 3rd Avenue and go west. Bear right at Veteran’s Memorial Blvd. Go right thru the first floodwall opening and run west on the path thru Harris Riverfront Park. Exit the park thru the next floodwall opening, turn right and resume on Veteran’s Memorial Blvd. This becomes Virginia Avenue shortly and continues west approximately 2 miles. Turn left on 12th Street West up a short hill. Turn right (west) on Washington Avenue. Turn left (south) on 14th Street West and run thru Central City until you reach Memorial Blvd just beyond the train trestle. Turn right on Memorial Blvd and go to the start (left) of the trail that leads to Ritter Park. You will stay on this trail until Ritter Park. At 8th Street you enter Ritter Park. On entering the park you will do a counter-clockwise loop on the path which will go around the fountain and stay on the sidewalk or park path at all times. Exit Ritter Park at 8th Street where you will turn right (north) and head to 6th Avenue. Turn left on 6th Avenue and go west ¾ miles. Turn right on 1st Street staying east of the oncoming runners and head north. Turn right on Virginia Avenue and head east. This becomes Veteran’s Memorial Blvd. Turn left thru the floodwall and head east thru Harris Riverfront Park on the trail in reverse of what was done earlier in the race. Exit the park thru the next opening in the floodwall, turn left, and head east-northeast on Veteran’s Memorial Blvd. This turns into 3rd Avenue and you go directly east. This is the split between the marathon/half marathon. Marathoners will turn right on Hal Greer Blvd (16th Street) and continue south on the sidewalk. Half marathoners will continue east on 3rd Avenue toward the stadium/finish line. Volunteers will be on hand to direct marathoners/half marathoners. Half marathoners will enter the stadium at the east entrance from 3rd Avenue/22nd Street. Volunteers will be on hand to direct participants to the correct entrance. Go to the south end of the stadium and go right to the goal post. Then turn right and head to the finish line. Marathoners will turn left into campus at 4th Avenue and run along a brick path that takes you alongside “Old Main”. Follow this around a circle and stay north of the John Marshall Statue in the middle of the circle. At the statue head thru campus on the pathway heading east. Head straight towards Hodges Hall and then bear right just outside the building and head around it. GO right after the tennis courts and head straight to the Rec Center on the path. Cross 20th Street. Marathoners meanwhile will have turned right at 20th Street as noted then a left at 5th Avenue. The first 2 miles of the course is reversed so that now it will be left on 27th and left on 3rd Avenue. This is taken west and will then follow the first loop. Runners/Walkers will start east on 21st of 3rd Avenue until 27th Street. Turn right on 27th Street for quarter mile. Turn right again on 5th Avenue. Do not turn right on 5th Avenue/20th Street. This is only for the marathoners and half marathoners. Proceed west on 5th Avenue. Turn right at the Student Union. Turn right at the Memorial Fountain (water stop). Continue east through the campus until reaching 20th Street next to the MU Rec Center. Turn left on 20th Street and Right on 3rd Avenue. Continue east on 3rd Avenue until 22nd Street where you will turn right at the East ramp of the Football Stadium. Follow the ramp down to the stadium floor and toward the finish line. Congratulations! You have finished the Marshall University-HIMG 5k.